My dog is not only a rescue pup, he also rescues pups. Seal pups, that is. Rocket was born on the streets of Southern India. He was found, just weeks old, under a bush on the roadside. Two huge-hearted people took him and his brother into their home—the only two puppies to survive. With several other rescued street dogs who were too sick or injured to make it on the street, he made the journey—in a dog crate—from India to San Francisco. Rocket isn’t a mutt or a mixed breed. He isn’t a breed at all. He is an original Indian Pariah dog. The street dogs of India have evolved from an ancient strain of dog. They have evolved on their own in packs over centuries as wild dogs that coexist with humans. Rocket never gets hot, he is quite quick when he needs to be and can go a long time without food or water—in fact, he doesn’t care about food at all. Unless he has a good reason to, he has a very hard time staying put. But he is acutely protective of his pack, a deeply ingrained quality courtesy of his ancestors. As he does not live on the street with a pack of dogs, but rather loves to lounge around the house and to sleep under the covers with my two young boys―we are his pack. The San Francisco fog hugs Fort Funston Beach most mornings no matter the time of year. The sand is flat, wide and free of footprints. About a mile or so from the sandy trail down from the parking lot, several outcroppings of rock jut out from the beach, embedded with shells from ages past. On a spring morning, Rocket and I were jogging past them on the hard wet sand. “ARRRGH!” came a bark from the rocks. I turned my head to see a small brown pup tucked in a crevice of the rock a few feet from us. A California Sea Lion pup, to be precise. He was the color of the cliffs, with slick dark fur, a soft light face, long whiskers, and big round deep black eyes looking right at mine. “Well, hello,” I said softly. Rocket stopped his quick stride and headed over. He sat down at attention near the pup. He knew what to do. This had happened before. The spring of 2015 in California was one of the warmest and driest on record. Cars, factories, and other environmental harm have caused the warmer temperatures. The change in climate has affected the plants and animal most of all. The ocean water along the coast is now warmer, so many varieties of fish swim deeper to find the cold water they need to survive. These are the fish that seals and sea lions depend on for food. Mama seals and sea lions—called Pinnipeds—need to leave their pups behind to travel far out to into the ocean to find fish. They are often gone for long periods of time and the pups get separated. The babies don’t know how to hunt for food and many are still nursing. They become stranded on the beaches looking for warm sand and a place to rest. They are sick, fatigued, malnourished, dehydrated, and cold. In the spring of 2015, five times as many stranded Pinniped pups as usual were found along the California coast. One month before the barking rocks, Rocket and I were on Baker Beach, nearly at the foot of the Golden Gate Bridge. Out of the surf flopped a baby Northern Elephant Seal. He was four weeks old and should’ve weighed 250 pounds. He weighed 80. And he was far from home. A few weeks later we were running on Mussel Rock Beach near Pacifica and found a very fatigued and thin weaner California Sea Lion on the rocks against the cliff. He blended in so well with his surroundings that people had walked past without even noticing. Luckily I knew what to do. I called the Marine Mammal Center, an organization that rescues, rehabilitates, and releases sick or injured marine mammals. Volunteers are trained in identifying, diagnosing, and handling seals and sea lions. I told volunteers where the Pinniped pups were and send photos to be sure they did need rescuing. They did. The volunteers get to the animal as soon as they can. But in the spring of 2015, the volunteers were in high demand. They take the animals in a dog crate to the Marine Mammal Center facilities where they are examined, treated, and fed. Some of the younger animals are even taught to fish. They live in pools with other animals of their species and make a LOT of noise. When the scientists at the center are certain they are ready to live in the wild again, they are brought back to the shore. The seals and sea lions waddle as fast as they can back into the surf, swimming, flipping, and playing in their ocean home. They get a second chance at life. 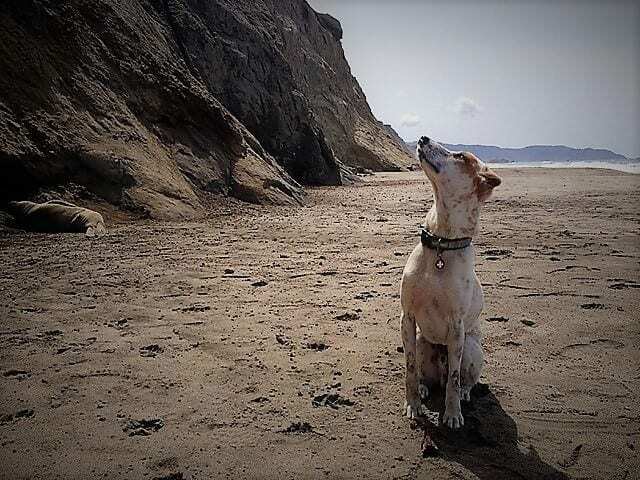 On that foggy spring day on Fort Funston Beach when the rocks barked, the volunteers at the Marine Mammal Center told me on the phone that it would take four or five hours for someone to get to us with the dog crate. So we waited. And waited. There was no way we would leave that animal, as he would not make it through the night. Rocket and I huddled against the rocks out of the wind, close enough to keep an eye on the pup but far enough to give him space. He watched us as we checked on him, not seeming frightened, then snuggled back down in the dry sand trying to stay warm. We watched a hawk swoop down right behind us and lift a snake out of the ice plant on the hillside. We watched pelicans flying in a low steady line over the water. We watched the tide slowly coming in. But mostly, I watched the pup, a wild animal in our care that day, a wild animal who needed us to survive. And mostly, my partner Rocket just watched out—today he had a good reason to stay put. Far off in the distance down the beach I caught sight of a dog running through the fog toward us, towards the pup. It was a quick and wily spaniel with no owner in sight. He was headed straight for the sea lion. Before I could get to him, Rocket was there like a flash. He zipped in between the pup and the dog, hair up on his haunches, baring his teeth, barking and growling at the dog. A deep hard-wired instinct had taken hold of him. Rocket became the fiercest animal I had ever seen. The spaniel tried to slip around him to get to the pup. But there was no way around Rocket. He pushed the spaniel back ferociously, ready to fight if he needed to. The sea lion pup screeched, a sound I had never heard before, pushed himself up on his front flippers and arched his head back. It must have taken all the energy that skinny little sea lion had. Rocket and I tag-teamed back and forth in semi-circles around the sea lion until I could finally grab the dog’s collar and put Rocket’s leash on him. Then the sea lion flopped back down on the sand. I ran down the beach to deliver the dog to his owners, who had just come into view through the fog. Rocket circled back and sat at attention near his pup. Hours later the volunteer arrived. We got the pup in the dog crate and carried him to the Marine Mammal Center truck. The pup ate fish at the Center and swam in the pools with other rescued California Sea Lions and made a LOT of noise. The staff nourished that little baby back to health. 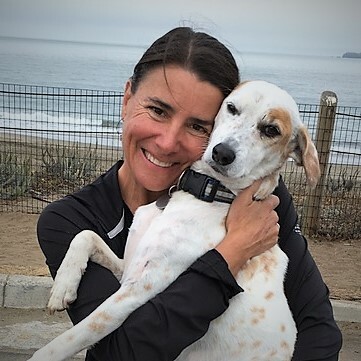 One month later, the pup that Rocket waited with for hours, protected, and helped get to safety was released back to the waters of Northern California. On that spring day, on that deserted beach, that pup was Rocket’s pack. Whitney is a social worker and sports coach who lives in San Francisco with her two boys, her husband, and Rocket. Her love of dogs and all animals was passed down by her mother and she now shares that gift with her children. Rocket was not always easy, but with patience and lots of love, Rocket has transformed into a patient, responsive, snuggly dog. Though Whitney may wear a lot of black, Rocket is lucky that she adheres to the belief that no outfit is complete without dog hair!